The Ponte luxury leather key ring is the perfect small gift for the discerning individual. 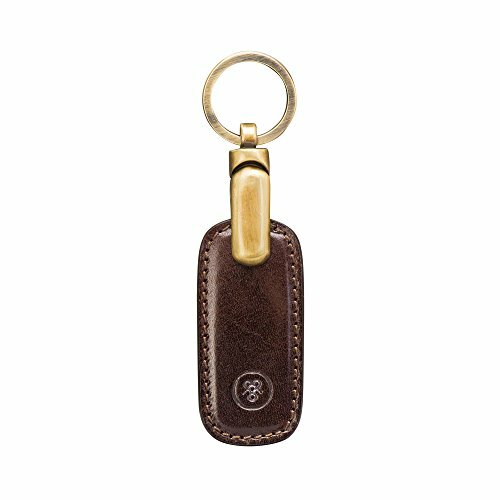 Hand stitched and made with luxury Italian leather, this key ring is lightweight and practical, allowing you to find your keys with ease and in one place. We are dedicated to the total satisfaction of each and every customer. We are aware that our gents leather wash bags are certainly not the cheapest on Amazon, however once you have bought and owned a Maxwell Scott product; you will understand that they offer incredible value. We would also like to point out that we have arguably some of the best feedback on Amazon. PLEASE NOTE that this item can be embossed / personalised / engraved. Handmade in Italy by master craftsman. Luxury leather key ring - Comes with INDUSTRY LEADING 25 YEARS WARRANTY! One main metal attachment ring, Hand stitched in Florence, Italy.